One of the problems with the brushes I bought is that they themselves need to be cleaned and "charged" prior to use. 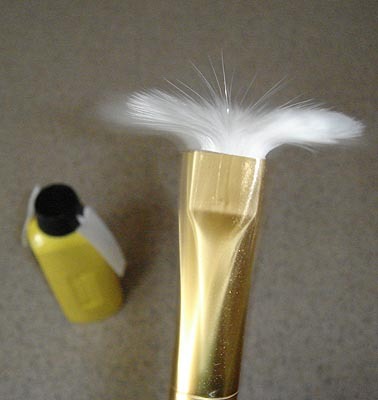 These tasks are both accomplished by blowing canned air throught the brush filaments. But this makes the system less portable. It is also not allowed to take canned air on a commecial aircraft. 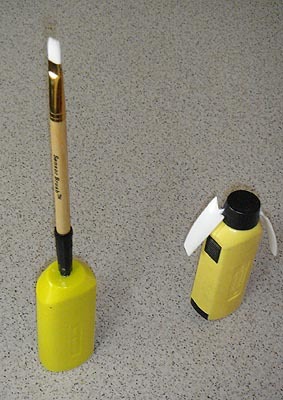 The company who sold me the original brushes came to my rescue with a "revolutionary" new product to solve the problem. After shelling out another obscene amount of cash I was the proud owner of a cheap plastic gizmo that would spin a cheaper version of the original brushes that I had purchased. It worked OK but I wanted the flexbility of using the different sizes of brushes in my original kit. The company had another new product coming out to fit my needs, a device that would spin my old brushes to charge and clean them. Ever the gullible one, I was prepared to fork over another $40 USD for the new product, until I saw the note on their web site saying my brushes were too old to fit the new device. That was the proverbial last straw for me. Having seen the first spinning device they sent, I figured I could find a way to spin my old brushes for less than the $150 or so it would take to buy the new device and new brushes to fit it. I was right. I'll give credit to my dad here. I mentioned to him I wanted to buy a cheap device with a motor-driven shaft that would run on a battery. (I'm sure suitable bare motors are available from Radio Shack and other electronic shops but I wanted something with a case around it.) Dad suggested a battery powered personal fan. A quick stop at Wal-mart produced such a fan for the reasonable price of $1.46 USD. (It was located in the camping section.) The fan runs on 2 AA batteries. 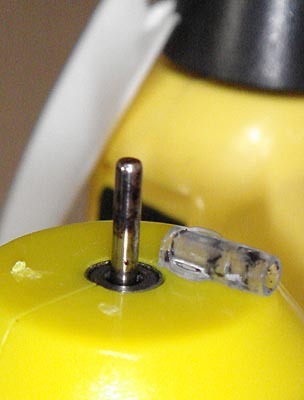 The fan blade assembly pulls off easily to expose a bare shaft. 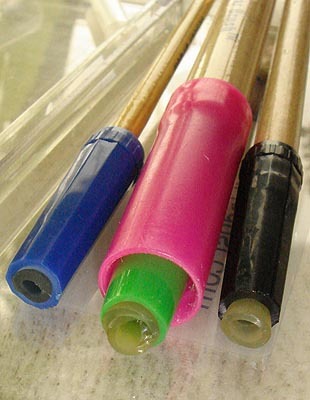 The trick is to attach the brushes to the shaft. I accomplished this with combinations of surgical tubing and pen caps. The resulting device spins my old brushes every bit as effectively as the $40 version. Sometimes the brushes don't spin exactly on axis and need to be held while they spin. I do this with a small strip of paper as a bearing. Hopefully the pictures below are self-explanatory. My completed spinning device on the left and the original fan on the right. to fit of the fan shaft. 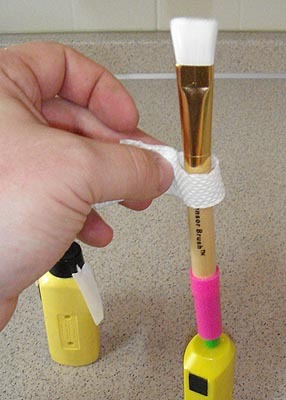 tube of a ball point pen to make it thicker. 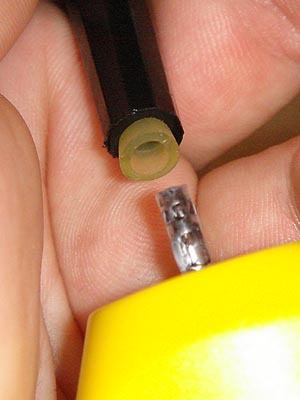 Fitting the modified brush end to the fan shaft.